Baga is a town in the northeastern Nigerian state of Borno, close to Lake Chad, and lying northeast of the town of Kukawa. It is located within the Kukawa Local Government Area. 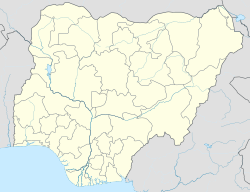 The town is approximately 196 km from Maiduguri, the capital of Borno State. The "Doron Baga" fish market, as of 2000, was located about six kilometres from the town. Baga used to lie on the border of Lake Chad and was a fishing center itself in the 1960s and 1970s, but the diminishing size of the lake has caused fishermen to move, and others have turned to subsistence farming. Baga appears on a peninsula jutting into Lake Chad on this 1973 map. In April 2013, over 185 people were killed and over 2000 homes in Baga were destroyed as a result of fighting between the Nigerian military and the Boko Haram Islamist group. In January 2015, Boko Haram again attacked the town, seizing it and the military base used by a multinational force set up to fight them. The town was burned and the people massacred — perhaps 2000 deaths — the largest such massacre in Boko Haram's history. Some residents escaped to nearby Chad. Although according to the Nigerian Ministry of Defence no more than 150 people in total had been killed, including militants. Several government officials denied that the fatalities were as extensive as reported, with some even claiming that the massacre had never taken place or that the Nigerian military had repelled the militants from the region, a claim that was refuted by local officials, survivors, and the international media. Satellite imagery taken on 2 and 7 January was released by Amnesty International showing that in Baga, which is "less than two square kilometres in size, approximately 620 structures were damaged or completely destroyed by fire." In Doron Baga (or Doro Gowon), located about 2.5 km away, fishing boats present on the 2nd were no longer visible, and "more than 3,100 structures were damaged or destroyed by fire affecting most of the 4 square kilometre town." On 27 December, Boko Haram attacked a military base in the town of Baga, killing 10 people and according to some reports, Boko Haram may have taken over the town. ^ "Nigeria fighting 'kills scores' in Baga". BBC News. 22 April 2013. Retrieved 2015-01-10. ^ "Boko Haram massacre thousands, says Amnesty International". Sydney Morning Herald. 10 January 2015. Retrieved 11 January 2015. ^ "Nigeria: Massacre possibly deadliest in Boko Haram's history". Amnesty International. 9 January 2015. Retrieved 11 January 2015. ^ "Boko Haram seizes army base in Nigeria town of Baga". BBC News. 4 January 2015. ^ a b Smith, Alexander (8 January 2015). "Boko Haram Torches Nigerian Town of Baga; 2,000 Missing: Senator". NBC News. National Broadcasting Company. Retrieved 8 January 2015. ^ Olanrewaju, Timothy (9 January 2015). "One week after Boko Haram attack, corpses litter Baga". The Sun (Nigeria). Archived from the original on 10 January 2015. Retrieved 9 January 2015. ^ "Boko Haram suffers heavy defeat in surprise attack on military base". News Express. 5 January 2015. Retrieved 9 January 2015. ^ "Islamists kill at least 10 in bid to capture northeast Nigerian lake town: residents". Reuters. Retrieved 2018-12-28. ^ "Boko Haram Terrorists attack Nigerian Military base, seize weapons cache in Baga". www.thenigerianvoice.com. Retrieved 2018-12-28. This page was last edited on 27 February 2019, at 18:48 (UTC).